One of the new products which accompanies the vSphere 5.0 release is the Virtual Storage Appliance. The purpose of this product is to allow customers to utilize the local disks on the ESXi hosts in order to create a shared storage environment for their virtual infrastructure, thus being able to take advantage of the advanced features such as HA and VMotion which are reliant on shared storage. The idea behind this is to avoid the costs of a hardware based SAN/NAS system to allow SMB customers to implement vSphere and its advanced features at a more attractive price point. The VSA cluster is two (or three) VMs that run in the ESXi environment. Depicted above is the architecture from a storage perspective, and its important to understand the levels of abstraction and how we finally arrive at a shared storage resource. The the very bottom of the stack, is the physical ESXi host (physical server) which houses the local hard disks. Presumably, there is some kind of hardware RAID capability in this server either as a function of the BIOS or a RAID card which takes all the disks and combines them together using RAID protection to give a local volume. VMware says that RAID10 is a requirement here, but this is not a hard and fast requirement as far as I can tell — more on that below. You then install ESXi onto this local volume and by doing so format it with the VMFS file system. When you install the VSA, the installer uses the remainder of the disk space not taken up by the ESXI install and the VSA VM itself for the “shared storage” capacity and presents that to the VSA VM as series of VMDKs which the VSA VM combines using a LVM to form a primary & secondary volume. 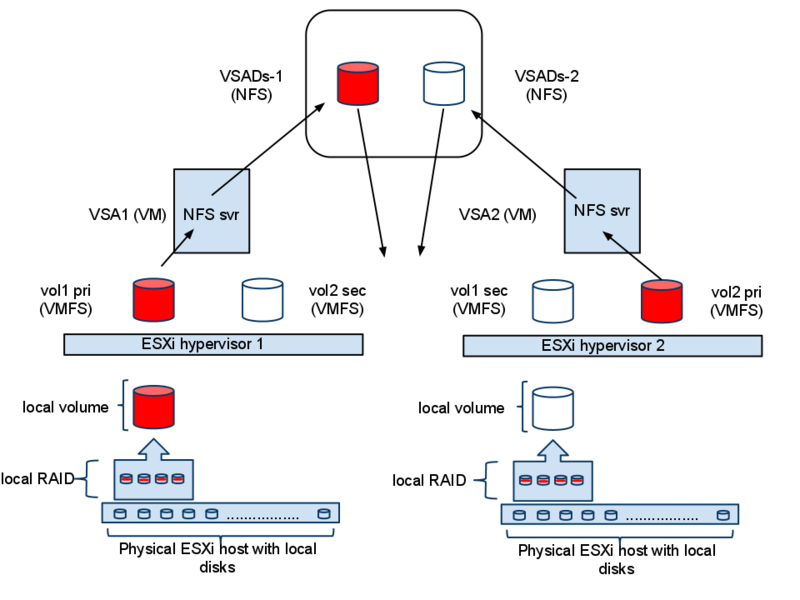 The VSA VM runs an NFS server and exports this volume back to the ESXi host. Each VSA VM does this, and hence you end up with 2 NFS volumes (in a 2-node cluster): VSADs-1 and VSADs-2. Just a little bit of inception going on here! 🙂 Its important to note that only half he space is actually exported as a NFS volume due to RAID10 protection. To elaborate a little on the the primary and secondary volumes in the VSA VM — remember that each volume exported by the VSA VM is protected via RAID10. So one half of the VSADs-1 RAID10 mirror lives on VSA1 and the other half lives on VSA2. In this way, the environment can tolerate disk failure as well as node failure and still remain operational thanks to the RAID10 protection. What I haven’t been able to dig into yet is the replication mechanism for keeping the primary/secondary volumes in sync. I suspect it might be something like DRBD (not verified, just a guess). memory overcommit on VMs is not supported when utilizing the VSA. VMware’s reason for this is because if swapping occurs, there could be severe performance slow down. I don’t necessarily agree with this, as if you put enough spindles in the local host, it should not be an issue. But again this is VMware’s official support statement. VMware says you should have 8 or more hard disks in RAID10 in the ESXi hosts. I see no reason why you could not utilize RAID5 or a different hard disk count. In fact, in my testing, I did not utilize any “local RAID” per se as I was running in a nested ESXi environment, and the actual LUN was utilizing RAID5 on the back-end in a FAST-VP pool. I suspect that VMware recommends a minimum of 8-disk RAID10 on the hard disks for performance reasons. But there is no reason why you wouldn’t treat spindle count on the ESXi hosts’ local drives just like you would for sizing a SAN LUN for traditional environments. Not enough spindles = performance issues no matter if they are local disks or SAN disks. But again, this is VMware’s official support statement requiring RAID10 and a minimum of 8 disks. the VSA mirrors the data utilizing RAID10 (a primary and replica volume each on different hosts). this is not configurable, so plan on this from a capacity perspective. If you have 8 disks in your ESXi host doing a RAID10 giving you a volume of 1TB, and you have 2 hosts for a total of 2TB — you will end up with 1TB of usable capacity in your environment. in VSA1 500GB will be primary, 500GB will be secondary, and similarly for VSA2. Next, we will look at how to get the VSA up and running in a nested ESXi environment and following that some general tasks and see what is/is not possible with the VSA compared to traditional shared storage as well as how it handles some failure scenarios. VSA looks very promising, but do you have any info how it will handle a split-brain scenario? will there be any manual recovery for duplicated VM’s or, better, some automatic recovery? Hey Freddy, I will be following up with some testing on that. So far, the results of have been pretty good!